Looking for charters fishing Lake Michigan for world class salmon and trout? Look no further than the Port of Sheboygan! I will never forget the time years ago that my friends and I went out on the Sheboygan charter boat, "Sorry Charlie" and I caught my biggest fish ever. A 30 pound Lake Trout! Wow, that was a big fish!! Sheboygan has one of the largest fleets of charter boats on Lake Michigan and they will get you out onto the lake for a chance to catch some of these big fish, or even bigger! 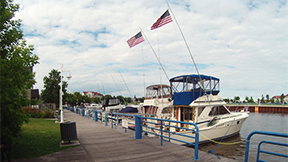 Our charter boats line the docks of Sheboygan's beautiful river boardwalk where there's lots for the family to do and see. There's the Blue Harbor Resort with an indoor water park, Harbor Winds Hotel, shopping, beauty salons, restaurants, pubs, ice cream parlor, hot dog stand, miniature golf, kayak rentals, bicycle rentals, tackle shops, and beautiful walks along the lakeshore and piers. So bring your family to Sheboygan, Wisconsin and take them out on one of our many charters fishing Lake Michigan. You'll make family memories that will last a lifetime! Be sure to tell your charter boat that the "Sheboygan Fishing Guy" sent you!! You will need a Wisconsin Fishing License with a Great Lake Salmon/Trout stamp. You can get a 2 day Great Lake fishing license that includes the Great Lake Salmon/Trout stamp for about $14.00. It's good for residents and non-residents alike. Here is a link to the Wisconsin Department of Natural Resources website where you can check different types of licensing, prices and buy a license online. You will need to dress warmly and in layers. Sometimes Lake Michigan can be cold, windy and damp. Other times its warm and sunny, needing only shorts and a t-shirt. These weather conditions can change during your charter. Most charter boats have canopies and heated cabins that keep you out of the wind, sun and rain, but you are out in the elements when you reel in your fish. Bring a rain coat. Weather conditions can change rapidly on Lake Michigan. Wear soft soled shoes. I wear tennis shoes. Bring a knit hat and light gloves. You probably won't need them but if weather conditions deteriorate, you'll be happy you brought them. Bring seasickness prevention pills. Seasickness happens rarely, but I must admit it did happen to me once. Bring a cooler with your favorite beverages and snacks. Bring a large cooler for your fish.